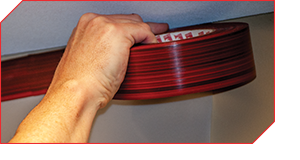 Electro Tape is scheduled to begin distribution of an all-new technical innovation in flame retardant Polyethylene (PE) tape known as Polyflex Plus FR100. The first-of-its-kind product was created to fulfill the increasing demand in construction, military and government building requirements with fire safety in mind. The all-new Polyflex Plus FR100 is a Fire Retardant poly tape with aggressive adhesive which provides superior bonding on a wide range of surfaces while allowing for clean removal and is easily identifiable by its distinct striped appearance. Polyflex Plus FR100 meets industry standards in flame retardancy test specifications set by the National Fire Protection Association (NFPA) Standard 701, which oversees flame propagation and testing of films and textiles. Additionally, Polyflex Plus FR100 is in compliance with ASTM E84 which tests for surface burning characteristics of a wide range of construction and adhesive materials.